Paris counts as a leading international tourism destination. In 2012, more than 15 million visitors and almost 37 million overnight stays were recorded in the capital (OTCP 2013). We can assume that the incoming visitors feel attracted by a variety of tourist sights, cultural institutions, and shopping facilities. Moreover, a vast and complex imaginary of the city comes into play when making the decision to spend a few days in the capital of France. In tourism research, Paris has been the subject of numerous studies. Particular attention has been given to the spatial dimension of tourism and visitor activities in the city. For instance, Pearce (1998, 1999) worked on tourism districts within the city, Duhamel and Knafou (2007) pointed out the centrality of tourism and the spatial concentration of tourism-related activities drawing upon the concept of the “central tourist district” (CTD) (Burtenshaw et al. 1991). However, tourism in Paris is not just about mass tourism being concentrated around a set of key tourism attractions. There is an upcoming debate about the tourism sprawl beyond the city limits into the metropolitan region of Paris (for example, in the project “Paris métropole touristique 2030” by Maria Gravari-Barbas). But also, within the city limits, an increasing number of visitors (in particular, repeat visitors or so-called repeaters) tend to explore the city well beyond its major tourism attractions. Repeaters seem to be interested in encounters with the local population and in taking part in the everyday life. According to Freytag (2010), they feel particularly attracted by the east of Paris. However, these findings are based on small-scale visitor surveys, expert interviews and observations. 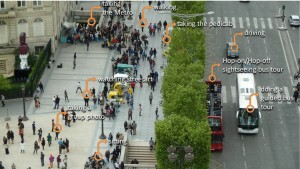 Figure 1 : Various modes of mobility in the city of Paris. Source : Bauder 2013. 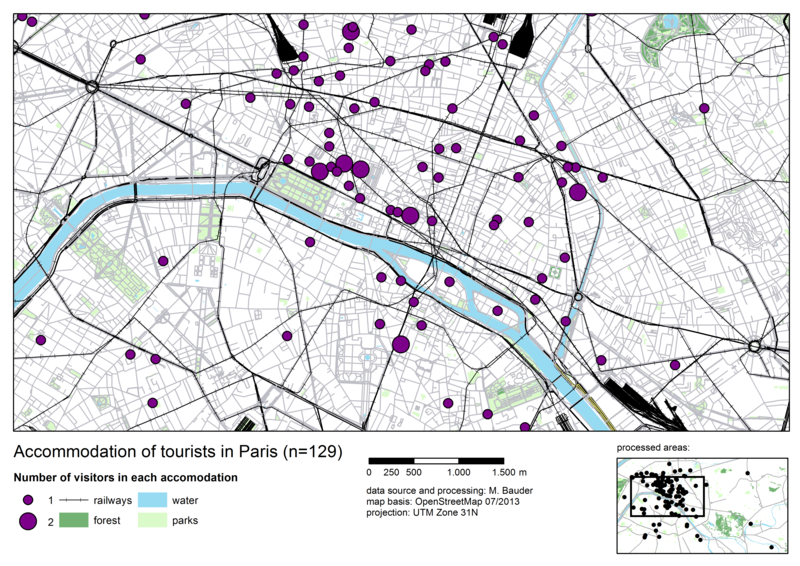 With the aim to establish a more accurate empirical basis to study tourist mobility in Paris, we conducted a combined visitor survey and GPS tracking study in May and June 2013 that was generously funded by the German Academic Exchange Service (DAAD) and the French Ministry of Foreign Affairs in the PROCOPE program. The method of GPS tracking allows to assess the exact position of visitors in time and space (Shoval and Isaacson 2007). In our sample, we considered 129 tourists (excluding business travel and visits of friends or relatives) who stayed for three or four days in Paris (not taking into account the days that were solely used for arrival or departure). The interviews were conducted at the main office of the local tourist information in the center of Paris (25, rue des Pyramides). The participants were asked to use GPS devices (Qstarz BT-Q1000XT and i-Blue 747A+) to document their mobility in the city. The level of participation was unexpectedly high with roughly one participant out of five to ten persons to be addressed. The main reason for exclusion was that the contacted persons did not comply with the predefined criteria (see above). Moreover, the rate of acceptance to participate in our study was affected by various factors including weather conditions (in case of longer periods of rain, many tourists were in a rather bad mood and less willing to take part in the study) and time of contact (usually a higher rate of acceptance in the morning than in the afternoon). Only in a few cases (concerning tourists from Italy and Spain without basic language skills in English, French or German), the refusal was a result of language barriers. 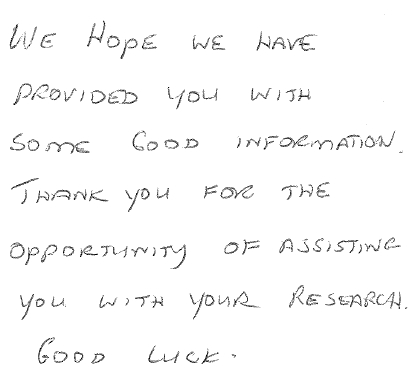 However, the majority of the addressed persons were very helpful and sometimes even grateful for the opportunity to contribute to the study (Figure 2). Accordingly, we can assume a high internal consistency and actual completeness of the collected mobility data. 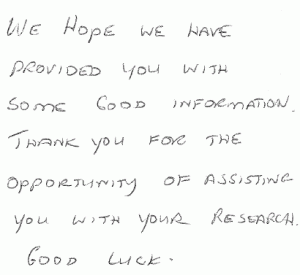 Figure 2 : A short note from a participant who returned the GPS device by mail. The GPS devices were returned by mail at the end of the study. Although we provided a post-paid envelope, which allowed the participants to send the GPS devices back to us at the end of their stay in Paris, a few devices were returned from the home countries with a note that the participants simply forgot to drop the envelope into a mail box before their departure. As a result, the time of circulation of the GPS device increased significantly. Hence, the device could only be handed out to further participants with a considerable delay to the scheduled research plan. Our sample consists of visitors from 25 different countries. The participants were aged between 16 and 77 years. In terms of the level of acceptance to take part in our study, we did not observe any data bias regarding the age of the tourists as opposed to other methods such as GSM tracking mobile phones (Olteanu Raimond et al. 2012). The ratio of first time visitors is 51.1 %, visitors with two or more prior visits account for 28.6 %. Having conducted our study at the local tourist office, we can assume that tourists visiting Paris off the beaten track tend to be underrepresented among the participants. 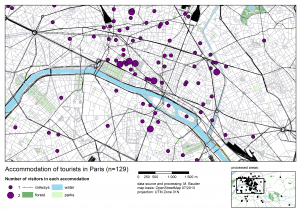 The visitors’ places of accommodation are well distributed in the city of Paris, while only very few visitors stay outside the city limits (Figure 3). The quality of the participants’ accommodation places covers a wide range from low-budget hostels up to luxury hotels. Figure 3 : Accommodation places of the participating visitors. Source : Bauder 2013. Taking into account the general picture of the collected GPS tracking data, we can observe that the vast majority of the visitor paths remain within the city limits of Paris that roughly correspond to the circular highway (Figure 4). Outside Paris, there are only two relevant spots : the palace of Versailles and the Disneyland Paris resort located in Marne-la-Vallée. When taking a closer look at Figure 4, we can find that even within the city’s boundaries many areas remain widely unexplored by the participants in our study. The highly frequented tourist area is limited by Montmartre in the north, the Arc de Triomphe in the west, the Panthéon in the south and the Place de la Bastille in the east. Tourist attractions that are located outside this core area, such as the Père Lachaise Cemetery and the Catacombs of Paris, are only visited by a very small number of participants in our sample. Figure 4 : Tourist mobility in Greater Paris. Source : Bauder 2013. 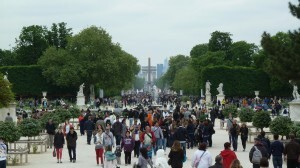 Figure 5 : Jardin des Tuileries, a major axis of tourist mobility in Paris. Photo : Bauder 2013. Within the city of Paris, several key tourism attractions come out very clearly (Figure 6). These are the places where visitors frequently go to and spend a considerable amount of their time. These intensely frequented places include the Eiffel Tower, the Louvre, the Sacré-Coeur (Montmartre), and Notre-Dame. In addition to these tourist hotspots, we can identify several major axes of tourism mobility, such as the Champs-Elysées, Rue de Rivoli, Avenue de l’Opéra, and maybe Boulevard Haussmann. Moreover, some areas can be regarded as tourist areas without being structured by dominant hot spots or axes of tourism mobility. These tourist areas include the Latin Quarter (just across the Seine river, south of Notre-Dame) and the Marais neighborhood, located southeast of the Centre Georges Pompidou. 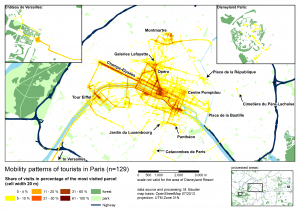 Figure 6 : Tourist mobility in the city of Paris. Source : Bauder 2013. The findings of our combined visitor survey and GPS tracking study widely confirm the delimitations of the central tourist district (CTD) identified by Duhamel and Knafou (2007). However, the accurate assessment of the visitors’ mobility in time and space allows not only to determine the boundaries of the CTD more precisely — encompassing a smaller area compared with the assumptions of Duhamel and Knafou (2007) —, but it also allows to differentiate between specific paths and places within the CTD that show extremely high rates of visitors. As highlighted above, a series of tourist hotspots, axes and areas can be identified. Consequently, the area that was conceptualized as a CTD does no longer appear as a homogenous tourist district, but rather as an area that is shaped and segmented by distinct paths and places that are highly relevant for the visitor’s mobility. 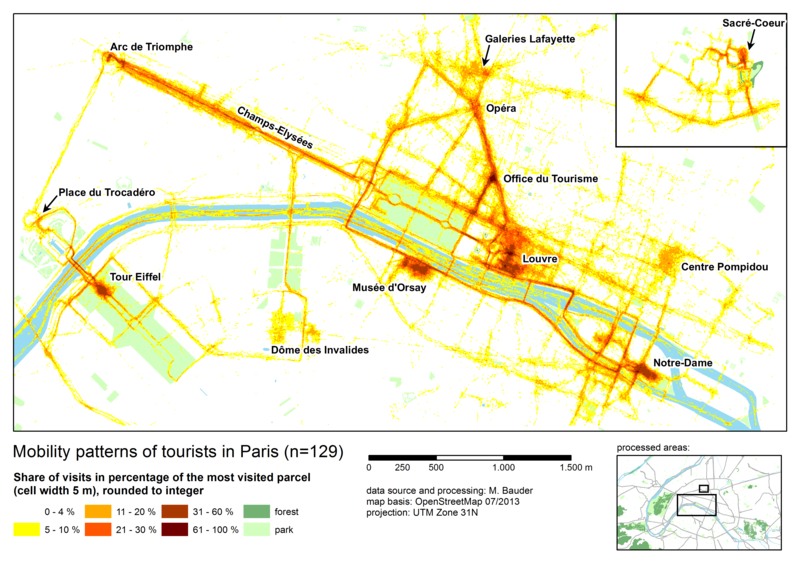 Compared with the findings from a study conducted in Berlin (Freytag and Weber 2012), tourist mobility in Paris appears to show an extremely high degree of spatial concentration. The visitor mobility patterns revealed in Paris are similar to what Keul and Kühberger (1997) call “ant trails” in their study on tourist mobility in Salzburg, Austria. So, even within a CTD, there are still areas which are widely ignored by visitors. Pettersson and Zillinger (2011) refer to these areas as “dead zones” in terms of tourist perception and destination management. All in all, our combined visitor survey and GPS tracking study opens up new perspectives for both tourism research and tourism destination management. A sound knowledge of tourist mobility and visitor activities in time and space is a valuable resource for optimizing visitor flows and the general tourist destination layout and structure (Huang and Wu 2012, Leask 2010, Xia et al. 2011). This can be complemented by studies in the field of tourist wayfinding (Kazig and Popp 2011). With respect to our future research activities, the collected questionnaire data combined with the GPS tracking data will be subject of a more detailed analysis. Using a digital interface (Bauder 2012), it is possible to identify and analyze specific mobility patterns of different types of visitors, which can be generated on the basis of individual questionnaire data. While other methods like GSM based tracking do not allow this type of in-depth analysis (see for example Olteanu Raimond et al. 2012), our approach is suitable for the comparison of empirically determined groups (Weber and Bauder 2013). Drawing on this methodology we plan to present a more detailed analysis including, for example, a comparison of the mobility patterns of first time visitors and repeaters, and the exploration of tourist mobility patterns under various weather conditions in Paris. Bauder, Michael. 2012. « Erfahrungen aus dem GPS-Tracking von Touristen. Konsequenzen für die Weiterentwicklung als neue humangeographische Methode » in Strobl, Josef, Thomas Blaschke et Gerald Griesebner (éds.). Angewandte Geoinformatik 2012. Beiträge zum 24. AGIT-Symposium Salzburg, p. 420-429. Berlin/Offenbach : Wichmann. Burtenshaw, David, Michael Bateman et Gregory John Ashworth. 1991. The European city, a western perspective. Londres : Fulton. Duhamel, Philippe et Rémy Knafou. 2007. « Le tourisme dans la centralité parisienne » in Saint-Julien, Thérèse et Renaud Le Goix (éds.). La métropole parisienne. Centralités, inégalités, proximités, p. 39-64. Paris : Belin. Freytag, Tim. 2010. 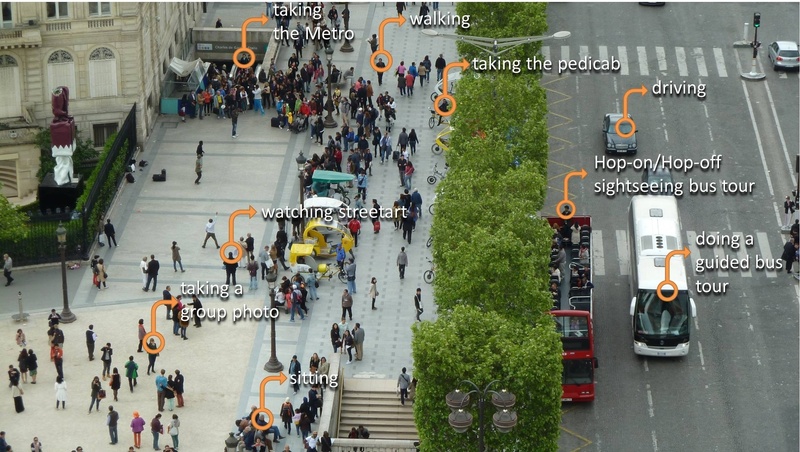 « Déjà-vu : Tourist practices of repeat visitors in the city of Paris » Social Geography, vol. 5 : p. 49-58. Freytag, Tim et Hans-Jörg L. Weber. 2012. « Flux de mobilité touristique à Berlin » Via@ revue internationale interdisciplinaire de tourisme, section « Cartes ». Gérardot, Maie. 2009. « Tourisme et métropole. Analyser le lien entre tourisme, métropole, métropolisation et métropolité par le rythme. L’exemple de Paris. » Thèse de doctorat, Université Paris 1. Huang, Xiao-Ting et Bi-Hu Wu. 2012. « Intra-attraction Tourist Spatial-Temporal Behaviour Patterns » Tourism Geographies, vol. 14, n° 4 : p. 625-645. Kazig, Rainer et Monika Popp. 2011. « Unterwegs in fremden Umgebungen. Ein praxeologischer Zugang zum “wayfinding” von Fußgängern » Raumforschung und Raumordnung, vol. 69, n° 1 : p. 3-15. Keul, Alexander G. et Anton Kühberger. 1997. « Tracking the Salzburg Tourist » Annals of Tourism Research, vol. 24, n° 4 : p. 1008-1012. Leask, Anna. 2010. « Progress in visitor attraction research. Towards more effective management » Tourism Management, vol. 31, n° 2 : p. 155-166. Olteanu Raimond, Ana-Maria, Thomas Couronné, Julie Fen-Chong et Zbigniew Smoreda et al. 2012. « Le Paris des visiteurs étrangers, qu’en disent les téléphones mobiles ? Inférence des pratiques spatiales et fréquentations des sites touristiques en Île-de-France » Revue Internationale de la Géomatique, vol. 22, n° 3 : p. 413-437. OTCP. 2013. Le tourisme à Paris, chiffres clés 2012. Paris : Office du Tourisme et des Congrès à Paris. Pearce, Douglas G. 1998. « Tourism districts in Paris : structure and functions » Tourism Management, vol. 19, n° 1 : p. 49-65. —.1999. « Tourism in Paris. Studies at the microscale » Annals of Tourism Research, vol. 26, n° 1 : p. 77-97. Pettersson, Robert et Malin Zillinger. 2011. « Time and Space in Event Behaviour. Tracking Visitors by GPS » Tourism Geographies, vol. 13, n° 1 : p. 1-20. Shoval, Noam et Michal Isaacson. 2007. « Tracking tourists in the digital age » Annals of Tourism Research, vol. 34, n° 1 : p. 141-159. Weber, Hans-Jörg L. et Michael Bauder. 2013. « Neue Methoden der Mobilitätsanalyse : Die Verbindung von GPS-Tracking mit quantitativen und qualitativen Methoden im Kontext des Tourismus » Raumforschung und Raumordnung, vol. 71, n° 2 : p. 99-113. Xia, Jianhong, Panlop Zeephongsekul et David Packer. 2011. « Spatial and temporal modeling of tourist movements using Semi-Markov processes » Tourism Management, vol. 32, n° 4 : p. 844-851. This article presents a series of the findings from a combined visitor survey and GPS tracking study that was conducted in May and June 2013 in Paris. The mobility of the 129 participants in this study is characterized by a high degree of spatial concentration at several major tourist attractions. Moreover, the most important axes of tourism mobility in Paris are identified.